On Holy Ground, though small at 12”x14”x14”, is a city sculpture which life-sized could comfortably stand by any given office building. Dressed in his finest uniform (suit, tie, pants perfectly pressed) the bronze figure would blend in well with the teeming businessmen of the city. He is tidy. His hair is groomed. Not too young, not too old, he is in his prime, at the top of his game. One expects his head to be held high and it is. Is he, like everyone else, focused on the horizon of his ambition? Thousands might note in passing that this is no hero, no grand general and no great statesman; in fact the crowds of the morning rush might not find him notable at all. Yet, though in business there is never a minute to spare, allowing him even a moment’s notice would pay off a hundredfold. Would some turn aside and see that he is not rushing as they are? Would anyone take time to look at his hands, to look at his feet? Bare feet. What has caused this perfectly dressed businessman to humbly remove his shoes? In the stillness of the erect figure, face looking upward, we do not see what he sees but we can perceive a heavenly and personal encounter. Perhaps it is a gesture of repentance that he holds his shoes so lightly? These details should bring to mind a man of another era who similarly, while busy at his workday job, had an encounter which changed his life forever. The book of Exodus tells us that, while minding his father-in-law’s sheep in the desert, this man came upon a contradiction: a green bush aflame but not consumed. He could have hastened on his way but for some reason did not. It is by no means certain that everyone would catch the allusion to Moses’ powerful call in the wilderness or know how in that place he met the living God face to face. Nevertheless, David Robinson’s sculpture speaks clearly. Today, under the bare feet of his everyday man, there is holy ground. Why is it called holy? The same question could be asked regarding the patch of desert near Mount Horeb and the answer is the same: It is holy because the Holy One is revealing himself there. Those of us in the habit of honouring people or places will dismiss the thought that God could reveal himself in a city—or in a desert for that matter. Like Barbra Streisand in her song ‘On Holy Ground’ we’re much more comfortable with the concept of God’s being limited to churches or other sacred spaces. Yet the universal message of the sculpture is clear: the whole world is potentially holy ground. Look how the globe extends beneath those shoeless feet. So here is the truth: There is no time or place immune to the intrusion (if you will) of the living God. Even in a city strident with buying and selling, God is able to reveal himself to people. And a corollary is this: There is no one immune to an encounter with him. Through Jesus Christ God’s great mercy extends to all who hear his voice. On Holy Ground is a title shared by six slightly different maquettes by the artist, one of which was designed with our imagined full-sized public monument in view. This monument in its humble ordinariness could well be erected anywhere in our overwhelmingly busy world where it would quietly present its own contradictions. In turning aside to look, the more humble of us could find ourselves being called into relationship with God. Would we hear the voice and remove our shoes in worship? There would be Holy Ground. Or would we close our eyes and hurry on our way? This meditation is dedicated to the memory of Fran Robinson, my friend and drawing partner. As mother of the artist, Fran was a singular force in encouraging David Robinson in his art. 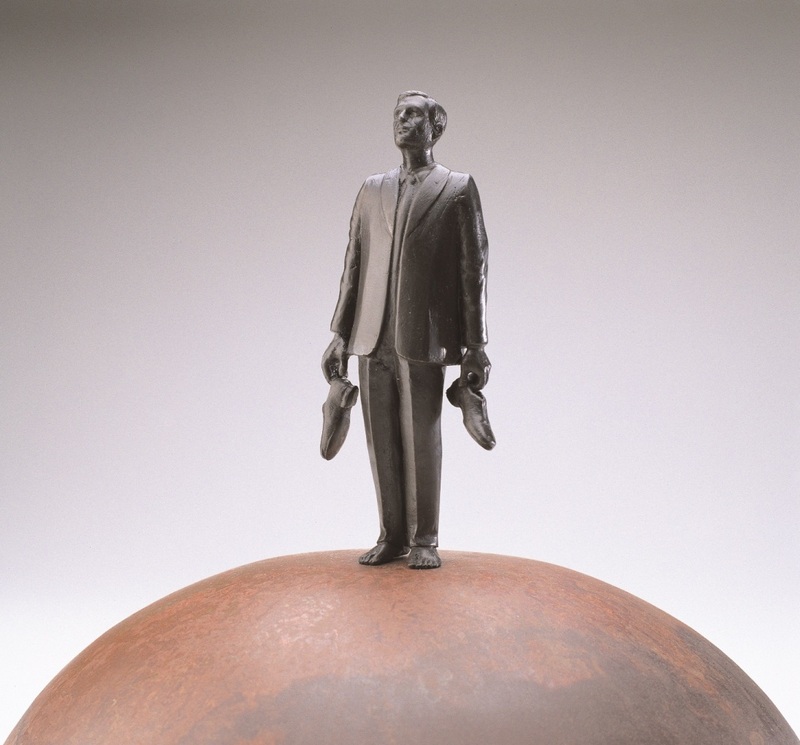 David Robinson: On Holy Ground, 30 x 35 x 35 cm, bronze and steel, 1999. David Robinson (b. 1964). The artist has been commissioned to produce several large-scale public and private works and his work can be found in many high profile collections across Canada. For an online bibliography and sampling of his art see www.robinsonstudio.com. Recommended also is the book Levitas/ Gravitas: the Sculpture of David Robinson, Vancouver: Robinson Studios, Inc., 2002. Irena Tippett has a Master's degree in Art History from the University of Toronto but it was during studies at Regent College that she discovered more recently the beauty of her field in relation to her faith. While most of her energy is presently spent in women's ministry at St. John's Anglican Church in Vancouver, she continues to lecture from time to time out of this new found passion.